IN THE second week of July, the pharma sector suddenly perked up. After a long hiatus in foreign acquisitions of Indian firms, a small Goa-based company, Cosme Farma, was picked by South Africa’s second largest drug manufacturer, Adcock Ingram, for Rs 480 crore. This was the first foreign acquisition after a series of big ticket buyouts saw the country’s premier pharma firms, Ranbaxy, Matrix and Piramal Healthcare, slip out of Indian ownership. Cosme Farma, with 2011 revenues at Rs 115 crore, was bought at a premium of nearly 13 times its earnings, and analysts believe that this marks a change in the Indian strategy of multinational corporations (MNCs). They believe small and medium-sized companies will now be the target of acquisitions for a variety of reasons— good distribution networks, popular over-the-counter brands and ongoing generics R&D—not least because the larger companies have steep valuations. The Cosme buyout is also the first brownfield investment after such proposals were brought under the purview of the Foreign Investment Promotion Board (FIPB) in November 2011 but the seeming quiet in recent months has been deceptive. (Brownfield refers to existing companies as opposed to greenfield which are new projects). There has been hectic lobbying for and against investment in existing companies with ministers, bureaucrats and industry taking diametrically opposite positions. Foreign direct investment (FDI) in both segments has been on the 100 per cent automatic route for the past decade but tellingly just 10 per cent of the investment has gone to greenfield ventures. Brownfield companies, on the other hand, have attracted investments of over US $10 billion. Not surprisingly, the series of acquisitions, which began in 2006, had set off alarm bells (see ‘Foreign firms make strategic acquisitions’). The official differences came into sharp focus last July when an inter-ministerial panel headed by Planning Commission member Arun Maira was asked to examine the issue of FDI in brownfield ventures. Specifically it was asked to analyse if such investments would impact the prices and availability of medicines and increase the country’s dependence on imports and, significantly, if this would result in curtailing innovation on low-cost medications for treating diseases that affect the poor. On the other hand, would checks on FDI dry up funds required for drug discoveries? Whereas officials of the finance ministry and Planning Commission felt there should be no curbs on FDI, others representing the Health Ministry, the Department of Industrial Policy and Promotion (DIPP) of the Ministry of Commerce and Industry, the Department of Pharmaceuticals and, according to some sources, the Department of Biotechnology, too, wanted some stiff riders imposed on investments in existing companies. Maira’s view was that any change in investment regulations would send the wrong signal that India was going back on its liberalisation policy. That, however, was not the primary concern of the core ministries which wanted investment limits so as not to imperil public health concerns. That view prevailed and it was decided that there should be vetting of FDI proposals. But here, too, there was sharp division over the agency that should act as gatekeeper. Maira wanted investments to be scrutinised by the Competition Commission of India (CCI) while others preferred that these be routed through FIPB. That difference was quickly resolved by the PMO throwing its weight behind Maira. However, since the Competition Act needs to be amended before CCI can vet pharma investments, it was decided that FIPB should be the gatekeeper for six months. That was in November. Since then, there has been systematic lobbying against FIPB, which was seen as a drag on the pharma sector because it was sitting on three to four FDI proposals amounting to some US $500 million, according to an estimate. As a result, the government set up a special group of officials from seven ministries—the new inclusions being the representative of the Ministry of External Affairs and, odder still, the Ministry of Overseas Indian Affairs—on May 29 to look at ways of streamlining approvals. The group was to submit its report on June 20 but an official source says it is still “grappling with ways of making its recommendation while resolving the differences of opinion”. But the outcome is already mired in controversy. One reason is the stance of PMO which is insisting that there be no discussion on the choice of CCI as the scrutinising agency. Letters have been flying thick and fast between the different camps, too. These differences, worries Shah, have clouded the thinking of the government. “Both the Maira committee and the special group are missing the essential point. 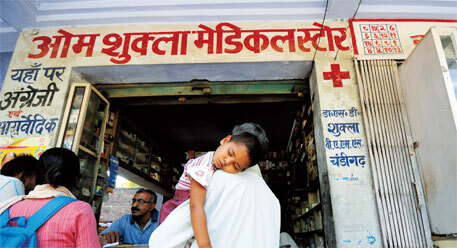 What is at stake is the future of the strategic pharma sector. Should we develop indigenous R&D and enhance our manufacturing capabilities or should we allow MNCs to take over the industry as they have done elsewhere?” he demands. 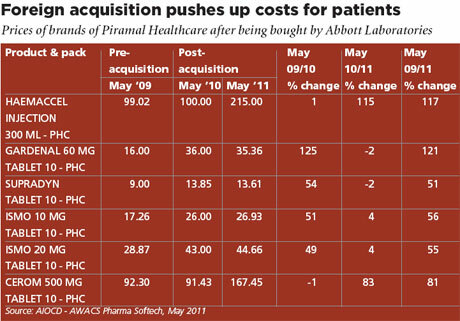 Cautioning the Maira committee against simplistic assessments of the major buyouts that have taken place, the Indian Pharmaceutical Association had in its presentation said that it was “inappropriate to measure the impact of this profound shift by change in price levels or impact on competition in a short period. The acquisition is a major strategic move and should be evaluated accordingly.” While it was too early to evaluate the full impact of this shift on the public health and the domestic industry, it said the few pointers that are available do not auger well for either. For instance, Matrix is focused on selling antiretrovirals to third countries; Sanofi is using the Shantha Biotechnics facility to make products for European and North American markets; and Orchid’s injectibles facility is used by Hospira for developed country markets. With industry seeking safeguards on FDI in existing companies as in other strategic sectors such as aviation, banking and insurance, it is likely that the special group will permit up to 49Ã”Ã‡Ãªper cent FDI on the automatic route and refer anything beyond that to FIPB. According to sources, foreign investors may also be asked to give an undertaking that if the company it is investing in manufactures an essential drug it will continue to do so after the acquisition. But it is apparently not in favour of the health ministry’s demand for mandatory technology transfer and R&D investment. There is also unlikely to be no going back on the PMO’s diktat regarding CCI. While Shah argues that CCI is not equipped to filter these acquisitions, other sections of the industry disagree. Anant Thakore, former president of the Indian Drug Manufacturers’ Association, believes the regulator is currently the best bet. “CCI is currently very active and a better judge of whether the policy is creating monopolies. Let it handle the matter for the next five years,” he says. But Shah argues that may be too late. “A couple of more acquisitions will create immense pressure on others to sell out. Those who do not may reduce themselves to contract manufacturing for the foreign companies.” That is already a trend.